The California-based law firm Sher Edling pitched the idea of a municipal lawsuit against major energy producers to top officials within the city of Miami that would seek to extract compensation from oil companies for present and future damages due to the effects of climate change, according to emails obtained through open records requests. The new documents add to the findings previously reported by the Washington Free Beacon that showed Sher Edling selling the idea to officials in San Francisco. Sher Edling is representing many government clients in suits such as this across the country, usually on a contingency fee basis, meaning the firm won't be paid unless it extracts some kind of monetary settlement from the companies or win a damages judgment in court. The contingency fee nature of the suits has led to vocal criticism from some Republican former top law enforcement officials who say the arrangement is inviting ethical problems. Dan Lungren, a former congressman and former attorney general for California, says AG offices are among the most powerful in government with their ability to prosecute, and one of the checks on their power is through how deeply funded they are by their state legislatures. Engaging outside attorneys to develop and deploy contingency suits expands their powers in ways that were not intended. "One of the big arguments for contingency fee practices in the United States as opposed to, for instance, England, is that this basically levels the playing field," Lungren told the Free Beacon last month. "That is, poor people, who could not otherwise afford lawyers, are able to get into court because the contingency fee contract system works. I don't think that applies when you're talking about public entities." "As someone who believes in small government—reasonably small government—I think this is an expansion of government with a reach that is not often looked at." Lungren added that his views were his own, and not representative of any associate or client with whom he presently is or previously was engaged. Additionally, Sher Edling picked up new clients over the Thanksgiving week, as some cities such as San Francisco and Oakland, which had originally decided to launch their suits with the law firm of Hagens Berman, dumped their original firm last Wednesday and hired Sher Edling to take over. Since their inception, the San Francisco and Oakland lawsuits have faced a number of setbacks and unfavorable rulings in court. The latest batch of emails which were obtained by Government Accountability and Oversight, a non-profit which describes its purpose as "pursuing transparency among activist bureaucrats," do not make entirely clear whether Sher Edling made the first contact with Miami or vice versa. Request for comment on that question and others were not returned by the law firm or by persons in Miami government. If the city intends to sue, it has not yet announced those plans or court filings. The Miami emails also show that a non-attorney, Charles Savitt, was a leader in the outreach to the city. Savitt is the "Director of Strategic Client Relationships," for Sher Edling, according to his email signature. He also is listed as the treasurer of a non-profit called the Windward Fund. The Windward Fund's website says it "incubates and hosts initiatives which pursue bold solutions to environmental challenges from a range of angles." The emails show officials in Miami government discussing how a climate lawsuit might affect bonds that residents of the city would be voting on for approval on Election Day. After many of the initial climate lawsuits were filed by places such as San Francisco and Oakland, questions were raised about whether the municipalities had disclosed the risks the cities claimed they were facing to those who had invested in their bond offerings. A January email shows an outside financial adviser and bond manager discussing potential divestment by the city in carbon-based energy companies such as Exxon and BP, the same energy providers in the crosshairs of the suits. "While we're exchanging emails … See the attached article," the adviser wrote to Jane Gilbert, Miami's chief resilience officer. "And given your network among the resiliency officers throughout FL, I believe it's something we should discuss more broadly," the email concluded. The attached article was from the Bond Buyer with the headline, "How an oil company would turn bond offering documents against California governments" and described a countersuit filed in Texas court by Exxon. "In the countersuit, the oil company's attorneys alleged that contradictions between the municipalities' bond documents and their lawsuits against oil companies could equal securities fraud," the article noted. 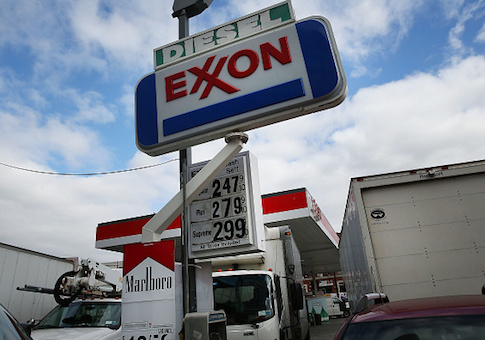 "If what the cities and counties alleges in the lawsuits is true, they have committed securities fraud for failure to disclose, ExxonMobil argues. Conversely, the argument goes, if the language in the bond documents was true, then the lawsuits against the oil companies are frivolous." The issue of governments suing energy producers came up briefly in the 2018 Florida governor's race. In February, Democratic gubernatorial candidate and former Miami Beach Mayor Phillip Levine, tweeted a video in which he said he believed there was "potential liability to suing the fossil fuel companies to have them pay for the problems that we're experiencing today." Update 8:56 a.m.: A previous version of this story incorrectly stated that the emails were obtained by the Competitive Enterprise Institute. The emails were obtained by Government Accountability and Oversight.